A couple of days ago I officially celebrated my one year work anniversary! It was a very unglamorous celebration consisting of my baking some chocolate chip cookies to bring and share with the rest of the marketing department. I've had some highs and some lows over the past year, but overall I am thankful that I have a job that pays me. It's crazy to think that I've been there a year, in some ways it seems much longer but in others it seems like just yesterday I was announcing my big switch from professional stay at home daughter to working girl. 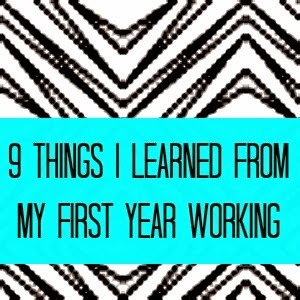 Today I wanted to share 9 things I learned from my first year working. What's the most important thing you've learned since joining the working world? As a young professional I'd love to hear any advice. Great tips! I agree that you should focus on the positive and the things you like about your job instead of the things you don't like! It makes for a much happier work environment! Very true things! I have discovered though, at least for my job, that every now and then, calling in sick because you're just too exhausted and can't face work is perfectly okay. A mental health day IS a sick day!